The light-footed clapper rail (Rallus longirostris levipes) is found exclusively in salt marshes between Santa Barbara, California and San Quintin Bay, Baja California, Mexico. Nesting occurs primarily in dense cordgrass, wrack deposits, and in hummocks of high marsh within the low marsh zone . Due to loss and degradation of salt marshes, the overall acreage and suitability of wetlands for the light-footed clapper rail has declined. The species was listed as endangered in 1970. The California population of light-footed clapper rails fluctuated significantly between 1980 and 2004, but showed a clearly improving trend from 203 pairs in eleven marshes in 1980 to 350 in 2004 [2, 3]. A captive breeding program initiated by the Chula Vista Nature Center, SeaWorld San Diego, the U.S. Fish and Wildlife Service and several independent biologists released more than 100 chicks between 2001 and 2005 . Zembal, R., S.M. Hoffman, and J.R. Bradley. 1997. 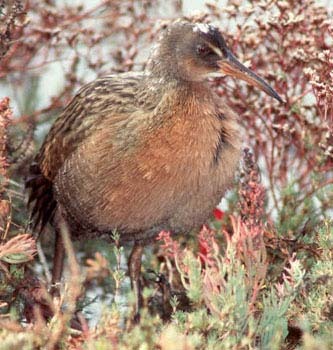 Light-footed clapper rail management and population assessement, 1996. Bird and Mammal Conservation Program Report, 97-08. Final Report to the California Department of Fish and Game, Sacramento, CA. Hayes, L. 2005. Light-footed clapper rail nesting data, 1997-2004. Data provided by Loren Hayes, U.S. Fish and Wildlife Service, Carlsbad, CA, August 1, 2004.